Copyright Warning: Content is Protected. In terms of enhancing the existing interior of your home, our glass flooring system is a more desired product in modern and contemporary home design. Our structural glass walk-on floors provide a magnificent focal point in any location of the property, and it provides a remarkable, unparalleled natural light penetration to the lower levels and especially works well to basement areas – which makes our glass floor system a unique and optimal choice to maximise the feeling of light and space in a multi-storey home. Our knowledge and expertise in interior glass design and home construction make us your ideal partner to bring stunning glass flooring into your home where more light and space is needed. 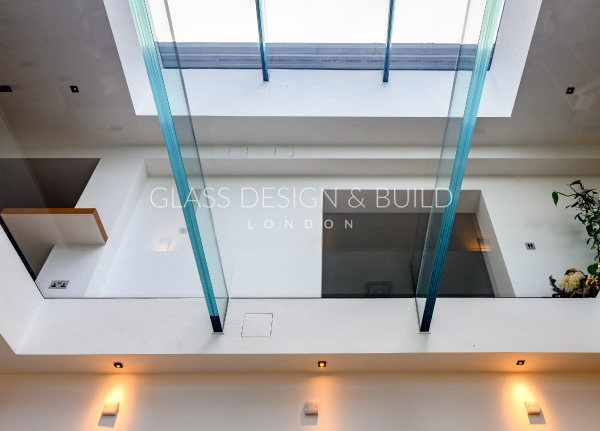 From our years of exclusive and creative design expertise at Glass Design and Build London, we appreciate glass in architecture and interior design as unparalleled in its creation of beauty and functionality – our glass floor installations are designed and technically engineered for multi-purposes and everyday living. 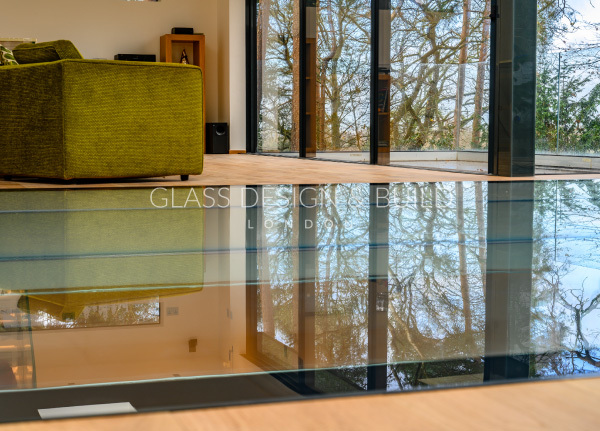 Our glass floor systems can also be designed to include enhanced thermal and acoustic properties, providing incredible insulation and thermal low U-value levels. For the ultimate minimalist design – we can replace some of the structural steelwork with structural glass beams made from extra-extra clear glass providing total clarity to the structure – giving a stunning effect. If privacy between floors is required, we can provide various levels of obscurity so that rooms are kept private without risking their loss of light, for example – the glass can be sandblasted, acid etched or can even be made electronically switchable from clear to opaque by remote control. We design, engineer and install glass floor systems for a wide range of homes and residential interiors for a multitude of purposes – if you require more light into the lower levels or basement areas of your home or you like the idea of creating greater transparency between floors – our structural engineered glass flooring is visually impressive and is the ideal product of choice. “This project is not just a very good installation, it’s actually a work of art due to the exceptional level of attention to detail, giving fantastic effect to the kitchen in the basement below – simply stunning”. 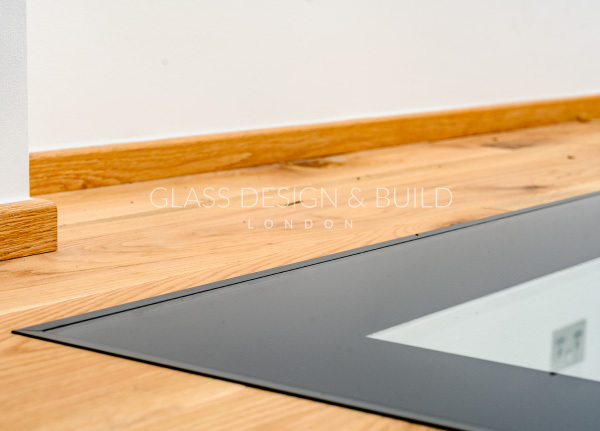 For further information about our glass floor systems, please contact Glass Design and Build London on 0207 074 8989, or email us through our contact page. "We would like to convey out sincere gratitude to you and all the members of your team that worked on our home creating our fabulous new extension. My husband and myself particularly like our new kitchen and all the extra space we now have. We know that some of the build was difficult due to the shape of our house." "We would like to thank all the team that worked on our home, particularly Jon and Malkick as nothing was ever a problem whatever I asked. We are amazed at the amount of glass that we have now and we can’t stop looking at the views - WOW! and Carl especially loves the new sound system you built into the new living room. Again, we thank you all for the hard work and allowing us to see the incredible countryside around us."